Clara Villegas is Head of Image for the fashion brand Maison Kitsuné. Her work often takes her to Asia and Milan. Tee-shirt: Maison Kitsuné. Leggings: Oysho. Running Shoes: Nike. All Images by Corinne Stoll. As a result, her time in Paris is spent taking care of herself, trying out Italian recipes collected in Milan, heeding her naturopath sister’s advice, taking singing classes (her take on Francoise Hardy’s Une Miss s’immisce was featured in a teenage love scene in Juste la Fin du Monde, by Xavier Dolan), running along the Canal Saint Martin, and taking dynamic yoga classes. Inside/Out: What’s the first sport you ever played? Clara Villegas: Classical dance. I still remember the careful preparation before each class - pins and hairnets, tights, leotards - and my mother’s endless patience, bringing my sister and me to all of our extracurricular activities on Wednesdays. I/O: And the 1st sport that felt right to you? C: I think I found parts of myself in every sport I’ve learned, be it dancing, basketball, volleyball, badminton, or horseback riding. I/O: The athlete you look up to most? I/O: What’s a sports-related memory that has shaped you? C: Maybe failing the end-of-year classical dancing exam at the conservatoire, when I was 7 or 8. I think my body shape was a bit too thick, according to the criteria of the times. For a more positive memory, I was in Sicily for the Italy vs. Germany game during the European soccer cup, and I don’t usually follow any games, but I thought it might be fun watching this one alongside the locals, in the atmosphere. So I sat at a terrace with an almond granita, and I had a really good time. 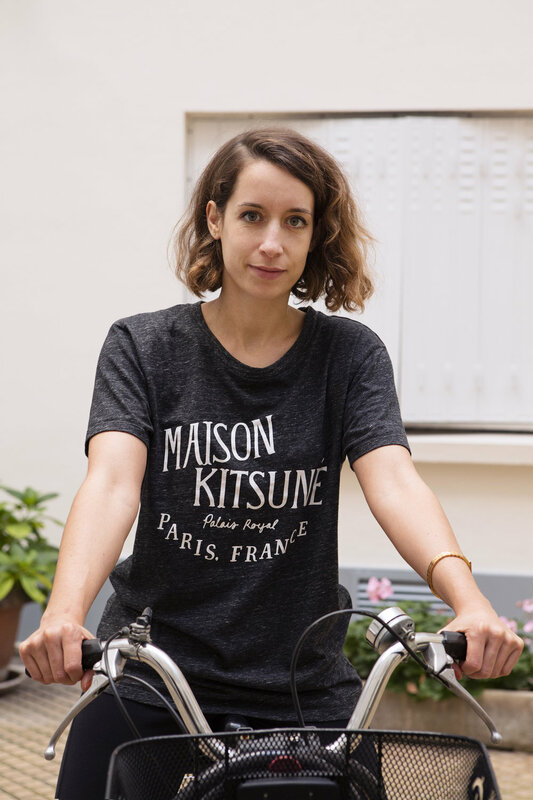 Tee-shirt: Maison Kitsuné. Leggings: Oysho. Running Shoes: Nike. 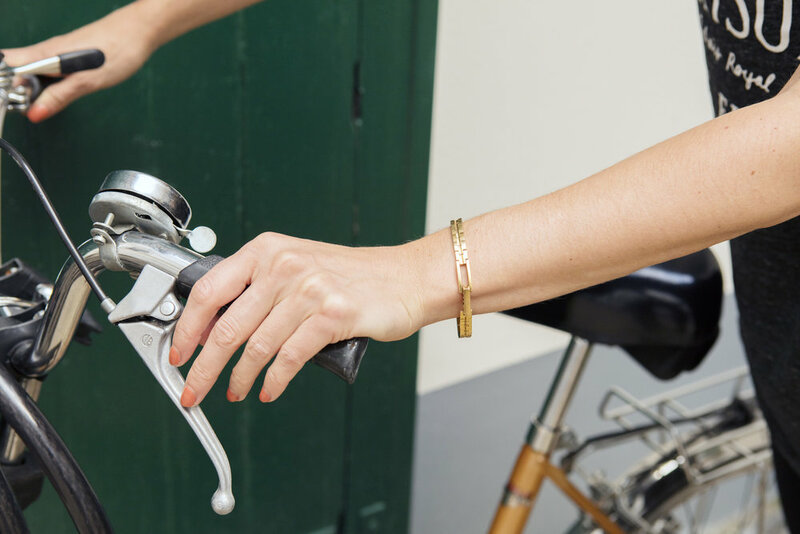 Bracelet: La Petite Fripe. I/O: Does getting out of your comfort zone when you train give you strength to face challenges in your everyday life? C: I like exercising my will when training: you have to find the will to go, the will to do it for as long as you’ve planned… It’s the same in everyday life: facing obstacles and challenges in my professional or personal life takes will, and mental strength. I/O: How do you balance your work and personal life? C: I’m single and have no children, which gives me a lot of time for myself and my well-being. I’m aware that it won't go on forever, so I try to make the most of it, either by learning a new language, traveling, or going to the movies twice a week. I would love to take up boxing, but I don’t know how I would fit that into my busy schedule! I/O: How would you define the Parisienne’s connection to wellness and sports? C: I don’t know if it’s because I’m getting older, or if it’s just a trend, but most of my friends practice some type of physical activity on a regular basis. I think it stems from a need to stay fit, but also to get away from Paris’ frantic rhythm. I/O: Do you think Paris’ relation to sports has changed in the past few years? C: I think that the media’s obsession with youth pressures people into aging gracefully and in good health. I/O: How about the relation to sportswear? C: Sportswear today can be a luxury item. The rappers and RnB singers who top the charts wear both couture and sportswear, and have contributed to that movement. Just look at the latest Gucci tracksuits! I/O: How does French Touch translate to sports? C: How about a racketball game followed by an apéro, complete with a glass of red wine and a cigarette? No, I guess that was in the 70s. Today, it’s dynamic yoga, spelt pancakes and aloe vera drinks. I/O: What’s your favorite piece of sportswear? C: Whatever’s comfortable and doesn’t look like you just took out the trash. Something not too expensive either, and easy to wash.
I/O: What’s your favorite athletic or athleisure brand? C: I like going simple, so I shop at Nike. I also like Outdoor Voices, because their products are straightforward, color blocked, and not cheesy. I/O: What’s your typical training outfit? C: Black tights and a colorful top, I allow myself to wear what I’m feeling. But if I’m training, I’m not going to a party: if I spend too much time thinking about my outfit, I end up never leaving. It has to be easy and to-the-point. The less I think about it, the better. I/O: Have you ever travelled for the purpose of training? C: I went to Bali last year, and stayed in a small eco-friendly hotel with all-day yoga classes. I was doing yoga in the morning, and surfing in the afternoon. I came back in great shape! I/O: Do you have a fitness or wellness destination on your bucket list? C: I’d like to do a detox yoga retreat in India or Sri Lanka. Or maybe Costa Rica, to go surf, but I’m still too much of a beginner. Or a long horseback trek in desert landscapes! I/O: Does music play a central role in the activity you practice? C: Yes, I like putting music on while I do yoga at home. I feel like it makes me more graceful. When I run, I like to match my stride to the beat of the song. I/O: Do you believe in a new form of feminism? Do you think girls support each other more than they used to, in sports and performance? C: I’d say women today feel freer to push their own limits. I/O: Are sports a good way to create a sense of community? C: When I exercise, I really do it for myself, I focus on my mind and body, so I don’t really feel the need to reach out to others. I’m not sure I really feel a need to be part of a community, either, but it does make for a good conversation starter, and creates an affinity with other people, in my professional and personal life. Sweater and Jeans: Maison Kitsuné. Ring: Aurélie Biedermann. Pillow: Lab. 1 piece of advice to keep improving: Don’t overdo it if you’re hungover! 1 coach: Sophie, from Casa Yoga. 1 powersong: "Caro" by Wizkid. 1 website: My sister Jane Lise Villegas’ website: she’s a talented naturopath, and she’ll go through your health habits with you, from nutrition to stress patterns, and change them if needed! 1 food spot: Season, 1 Rue Charles-François Dupuis, 75003 Paris. 1 drink: A good coconut milk frappe latte, or a fresh juice, especially vegetable-based! 1 source of inspiration: Divine. Had she exercised at least a few times, she might still be with us today. 1 person we should interview: Verena Wiesendanger in New York.